The Pawngrabbers are in! 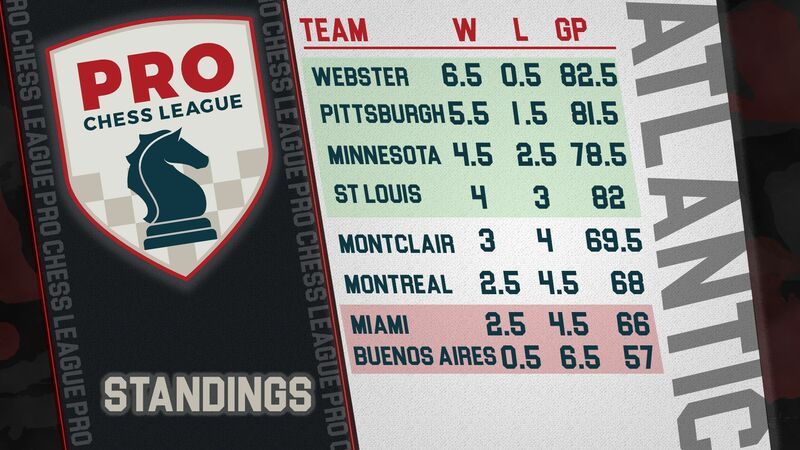 With 19.5 points and a 4th place finish the Pawngrabbers are guaranteed a spot in the 2018 PRO Chess League Playoffs! On a day that featured a Pittsburgh Line-up without GM Alexander Shabalov and IM Atulya Shetty, the Pawngrabbers squad showed how deep their roster is with over-performing Board 3/4 displays from NM Mika Brattain(3.5/8) and FM Edward Song (6.5/8). GM Awonder Liang (4.5/8) and IM Tuan Minh Lê (5/8) starred on Boards 1 and 2 to bring home the result. The Pawngrabbers unit clinched the win half way through Round 7 with 5 games remaining in the competition. Fielded against teams from the Central and Eastern Divisions, Pittsburgh had 32 games scheduled, and things got out to a fast start when Awonder and Mika both put together big wins against the Volga Stormbringers, 3.5-0.5. GM Eugene Perelshteyn stopped by to give us his thoughts on the two games. Next up was the Mumbai Movers, and even without the Former World Champion (or Current Rapid World Champion!) Vishy Anand on their line-up, the GM Baskaran Adhiban-led squad squeaked by Pittsburgh 2.5-1.5. Even with the head-to-head loss, Pittsburgh’s fast start kept them ahead of the pack, and were propelled into the the next round with this tactical shot and conversion from FM Edward Song. Notable absences from European Division teams proved to be their downfall, and a Marseilles Migraines team without Maxime Vachier-Lagrave or Etienne Bacrot proved to be particularly toothless, only scoring 5/32 and finishing dead last in the event. Pittsburgh cruised by with a perfect 4-0 score, thanks to Awonder’s win over GM Jean-Marc Degraeve. In what proved to be a growing theme of the day, Awonder punished another risky opening choice! Awonder followed this attacking win by crushing GM Luka Lenic from the Ljubljana Turtles. Lenic was one of the League’s top scorers going into Super Saturday, so the win, along with a 3-1 score in favor of Pittsburgh was a big achievement for the Pawngrabbers. Did you see that coming? From Board 2 Minh held his own, scoring 5/8 playing from Hanoi against higher rated opposition. The 22 year old has proven himself to be a strong free agent behind Awonder, as he’s scored an impressive 8.5/16 in his rookie season against a Grandmaster-level schedule. Now three hours into the match, fatigue began to play a factor as Pittsburgh fell 1.5-2.5 to the Armenia Eagles. However, even with the loss, Ed’s win over the Eagles’ manager CM Artak Manukyan was enough to clinch the win and playoff bid. Ed put together a 24 move miniature with mate on the board. Pittsburgh has little time before the all-Atlantic clash on Wednesday night with the Webster Windmills (5:55 PM EST). While both teams have claimed spots in the playoffs, the match will likely decide 1st place in the Atlantic Division and serve as a litmus test for Pittsburgh before the postseason. Want to be more involved with the Pittsburgh Pawngrabbers? Join our Booster Club for exclusive video updates, access to promotional events, and free merchandise!